Art-el Gallery will soon be introducing new artist Georgina Anton to the web-site. Her work is of differing contrasts from light and airy to dark and moody, but all her paintings have one thing in common and that is that they are simply stunning. Beyond the contrasting conditions of a youth spent in Leeds, Sheffield and Sydney Australia as an art student, the lifelong works of Georgina H. Anton have ultimately been shaped by the opposing powers of dark and light, tension and tranquillity and by Mother Nature’s ability to combine the chaotic with the clinical. Street art, Blue Note LP sleeves and the merging of far-removed techniques like textiles and music, were all sources of inspiration when honing her skills, before she went on to follow in the footsteps of peers Canaletto, Rene Mackintosh and Brett Whitely to name but a few. Once a humble, selective florist with an enviable client-base that featured an array of Australian A-list celebrities, as well as assignments for the Royal family, Bristol-based Anton effortlessly endeared VIPs with her unassuming approach. This held her in good stead and as her career path evolved, it led her to become an artist and collaborator who worked with prestigious contemporaries such as Psyops, Australian Fashion Week and L’Oreal New York, where top teamwork-derived results were produced by adopting Anton’s open creative process. The opportunity to combine fine art with floristry afforded Anton some invaluable insight into her organic creations and instinctive output. Whilst creating less flirtatious works that would signify her coming-of-age as a conceptual artist, designer and illustrator, she became friends with many established creatives including Mark Tappin & Simon Gofton (founders of TappinGofton) and photographer Kate Peters. Throughout every textured design, whether floral of otherwise, Anton still preserves her admiration and unapologetic reverence for spontaneity. It could be said that Anton, whose love of graffiti inadvertently led her to failing the 11+ exam, owes it all to a dedicated art teacher and the monetary gift of encouragement they left upon their passing, so as to nurture her obvious talents. Today, Anton’s audience remains appreciative of both her line and brush work, which thrives on the freedom she grants herself when working. Anton’s atmospheric creations continue to reflect her love of nature, aesthetics, simplicity and style, with loose, crisp edges currently guiding her long-serving curiosity with all things strangely beautiful. Please visit www.georginaanton.com for further information. 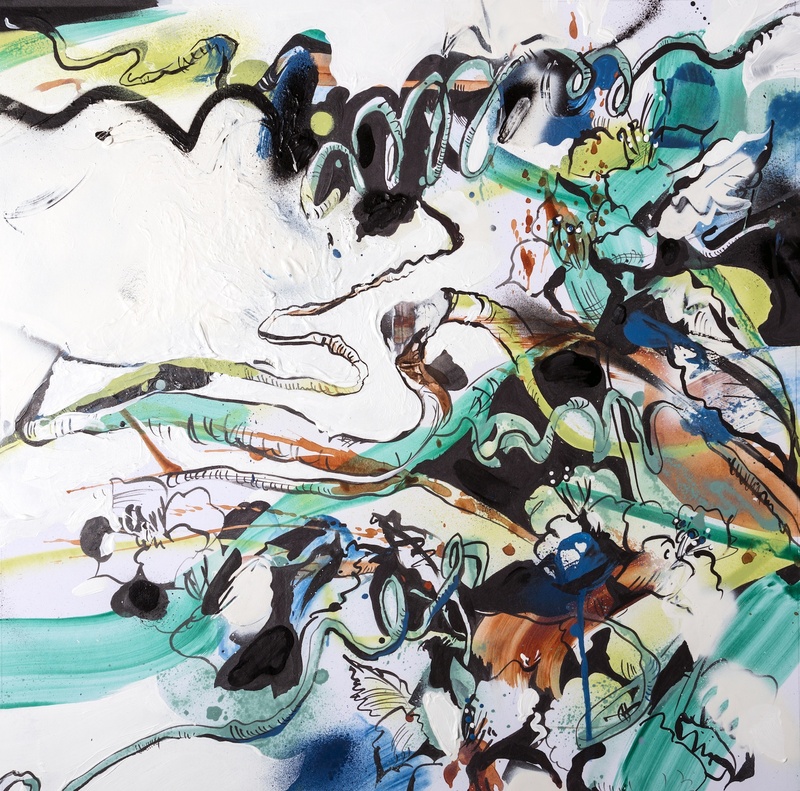 This week Dreweatts hold their annual Urban & Contemporary Art Auction, they have also added a charity collection for Temwa to their catalogue. The collection is currently on view at Dreweatts, 24 Maddox Street, London, W1S 1PP. There will be a launch party on Monday 10th December, 6pm-8pm, if you are in London you will be very welcome to come to the event which is sponsored by Staropramen & Averys Wine Merchants. If you are interested in any of the art work, yet unable to attend the actual auction which will be held on Tuesday 11th December at 4pm, we can arrange phone bidding, online bidding or reserve bids. This year’s ‘Art for Africa’ for Temwa collection is one of their strongest yet, boasting exceptional pieces from artists, including Mr Jago, andy Council, Jim Starr, Dicy, K-Guy and Adam Koukoudakis. Each piece has been uniquely created and donated to the event which means that all the money raised goes directly to Temwa. 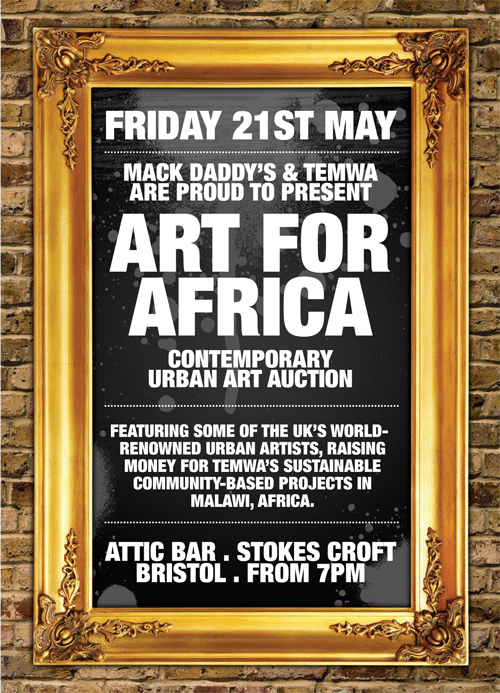 Temwa has strong links with the urban art scene and as been supported by a wealth of talented artist’s since the charity’s conception in 2003, with the Art for Africa auctions being held annually in Bristol and London. Temwa’s project’s in Malawi have expanded and are now helping to dramatically change the lives of thousands of people. A full catalogue of the work for sale can be downloaded, please click here. For further information please contact jo@temwa.org.uk or phone 07855 967 864. Win a limited edition print! First Prize: A Will Barras limited edition dry point etching: ‘Storm’. Artist proof. 5 of 10. Second Prize: A Rowdy print: ‘Neon Nightlife’. Digital screen print. 50cm x 70cm. Third Prize: A limited edition Paris design Temwa t-shirt. Created by Paris especially for Temwa. The raffle will be drawn at the launch party, and online tickets must be bought before 4.00pm, Monday 10 December. 100% proceeds are going to support Temwa’s projects in Malawi. A massive congratulations to the wonderful staff at Temwa for another great evening on Saturday. The sun came out and the beer garden of the Full Moon was packed. It was great to see some faces that we’d not seen for a long time and Babyhead’s Tom was roped in to play auctioneer again, which is always great comedy value and we loved the auctioneers claw hammer! But of course none of this was the reason for the night, and it was great to see people digging deep on the auction lots raising an astonishing £8,000 for the charity, all of which will go towards creating sustainable communties in Malawi. Thanks and big ups to all those involved and turned out on Saturday night. 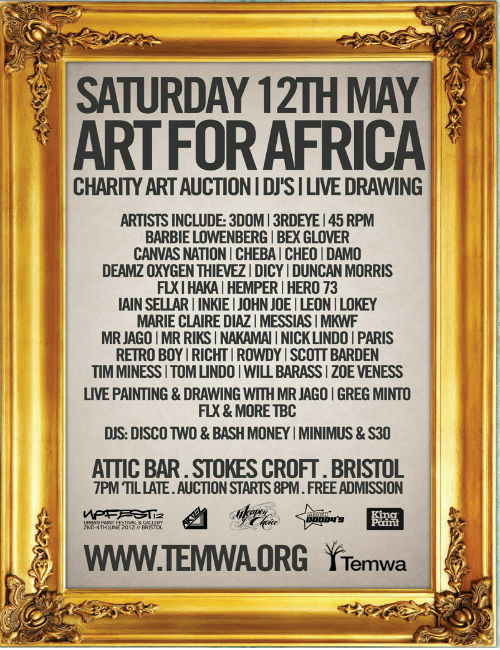 We love May, mainly because this is the month that Temwa hold their amazing Art for Africa auction. It has grown year on year and continues to raise much needed funds for sustainable community development in the African Republic of Malawi. You don’t have to collect art or even be a fan of it as the evening provides so much more, it really is a very entertaining evening. So if you’ve not been before then why not just give it a go, and for those of you that have well you’ll know what a good night it is already so we’ll see you there! Temwa is proud to announce that our annual Art for Africa Auction is back! Come on down to the Attic Bar, Stokes Croft, on 12th of May for one of our biggest events of the year. 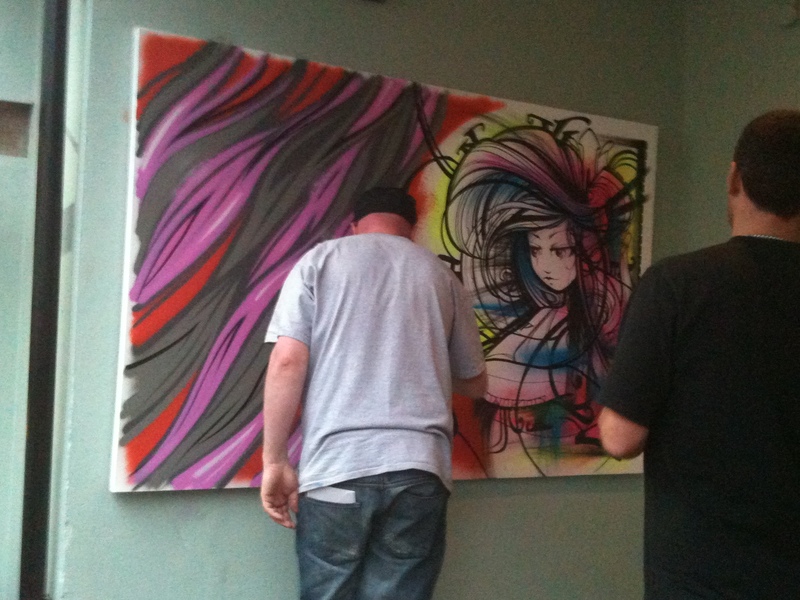 Some of Bristol’s world-renowned street artists including; Xenz, Inkie, Paris and FLX (to name a few) will be contributing, as well as some amazing up-and-coming new talent. This year we’ll be branching out beyond street art into other contemporary mediums, it’s all lined up to be an exceptional exhibition. A full catalogue of the work will be available from our Art for Africa website from Monday the 7th of May.As well as the chance to bag yourselves some incredible art in the auction, there will be live painting from Mr. Jago. Greg Minto and FLX, with more still to be confirmed.And it doesn’t stop there… if all that wasn’t enough, we will have live music from the Disco Two and Bash Money as well as live beat boxers Minimus and S30. 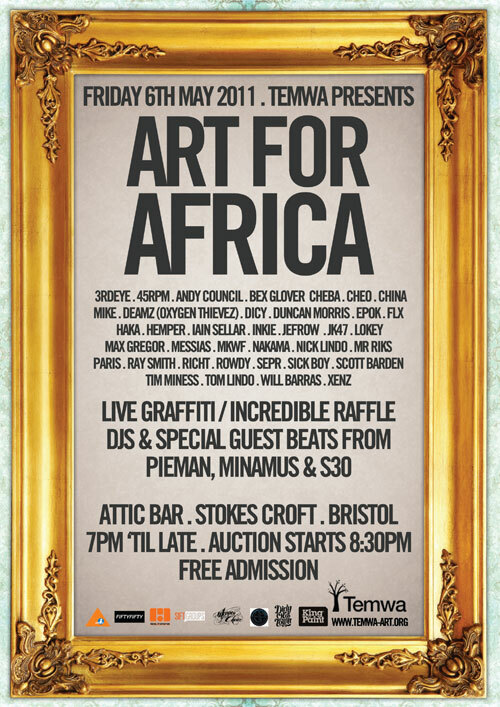 For a brilliant night out and to support an amazing charity head down to the Attic Bar in Stokes Croft on the 6th May. Temwa is a very hard-working Bristol based charity who are continually fund-raising in order to provide a sustainable future for the people of Malawi through community based projects. 100% of the profits from the event go directly to Temwa. 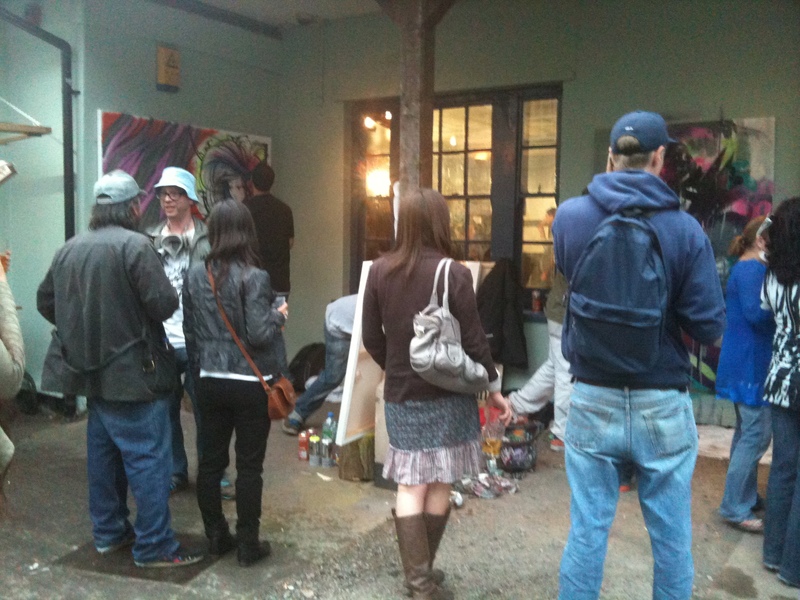 It’s a really fun night and you may even pick yourself up an arty bargain. These auctions are all about an artist called Rowdy. You may or may not know him or his work but you will have no doubt seen his trademark crocodiles. 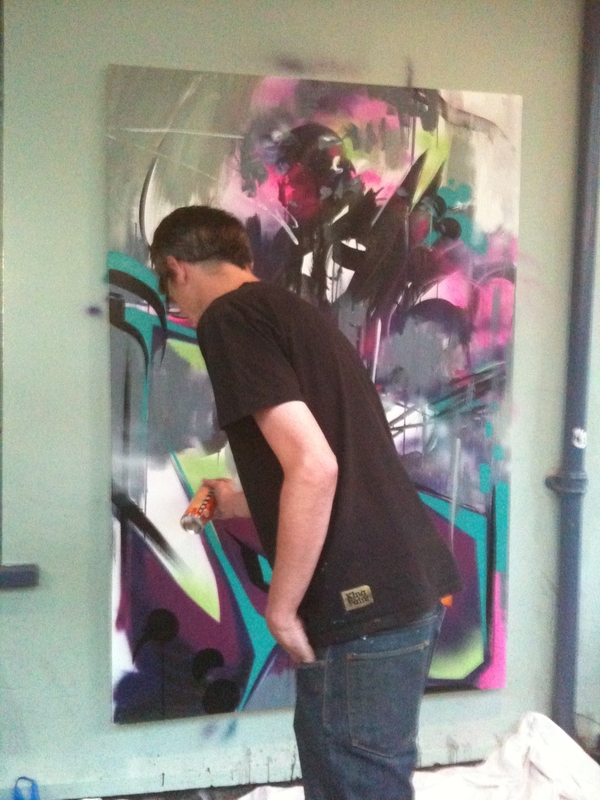 His career has been relentless; establishing in 1987 when he became an integral part of the Bristol graffiti scene and in which he is still remains instrumental. We have had the pleasure of working with Rowdy and he has become a good friend of ours and so were obviously devastated to hear when, recently left his house, (and studio) for a walk, he returned just half hour later, to find everything had been burned to the ground. EVERYTHING! ID, money, clothes, personal possessions, art, the ability to make art, everything gone! We realise that there are a whole host of charitable causes worth fighting for, countries that have suffered huge natural disaster who need aid, but there are times too when friends need help and so for the next couple of weeks there are a number of art auctions on e-bay, organised by Steal from Work and Burning Candy. All profit will go towards helping Rowdy get back on his feet and start over and to support someone who has so readily supported us as a scene by auctioning some art to help him get back to a position where he can do what he does best, making art. It’s a testament to his popularity and reputation that so many artists have donated work to this auction. All work has been personally donated by the artists and the galleries that represent them: Banksy, Paul Insect, Swoon, Sickboy, Hush, Espo, the whole Burning Candy crew and a whole bunch more… So, it’s your chance to buy something beautiful and at the same time help out someone who has helped in his way to make graffiti and street art what it is today. The auctions have started but there is still plenty of time to bid on the current auctions plus a promise of more to follow so go and check them out. There is also further information at the Steal From Work web-site including information on the lots in future auctions, please click on the image to direct you straight to the site. We would just like to say a massive WELL DONE to the Temwa crew for a brilliant and successful night, that saw over £9,000 raised for very worth while projects in Malawi. Amazing. The temwa art auction is not only a fund-raising event for a great and genuine cause but it’s also a really good night out aswell. 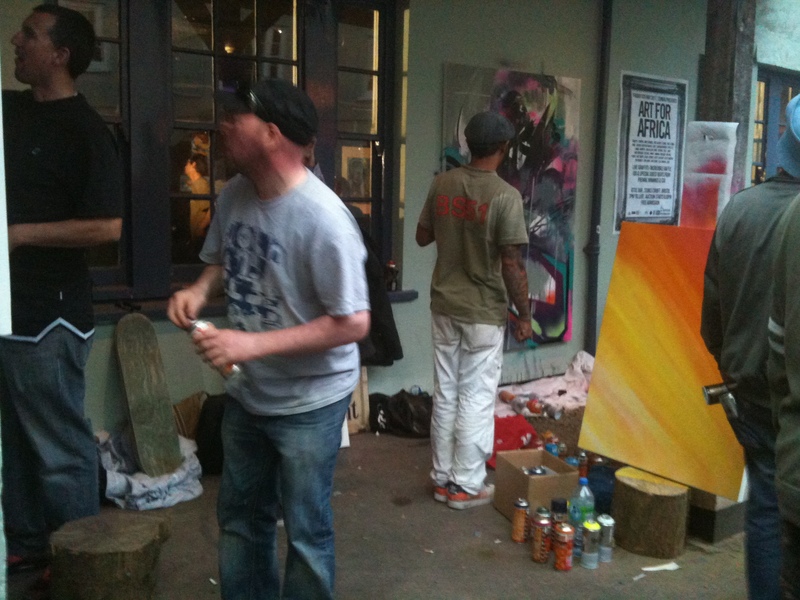 A great atmosphere and music from Monster Piece DJ’s, The disco Two and Bristol hip-hop afficionado Sir Beans. 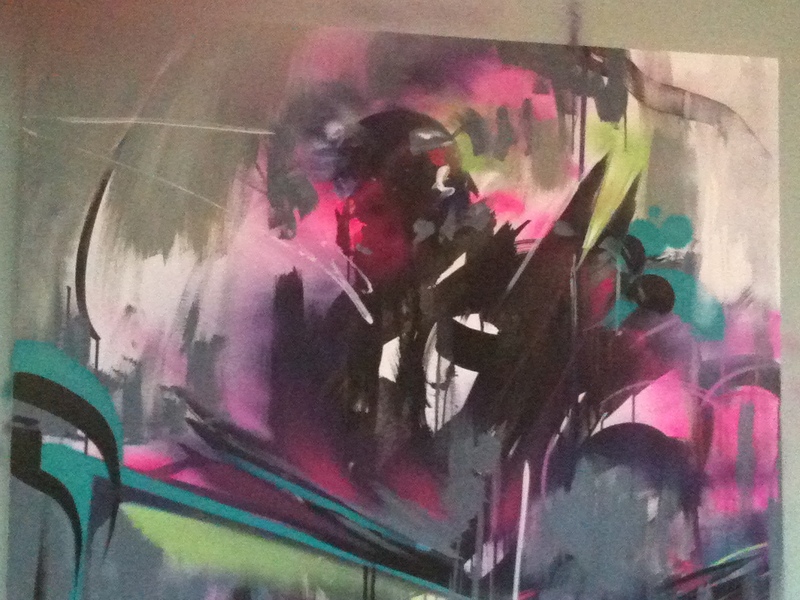 Also for the first time there will be live painting by Mr Jago and Will Barras, always good to see these two masters throwing up a piece. All this and a chance to grab an original piece of art whilst doing your bit to benefit some really worth while projects in Malawi. This year there is also an opportunity for people who are unable to attend on the evening to bid. Click here for a pdf file of the available work and how to bid if you can’t make it to the event. The event in 2009 was a great success but this year it promises to be even better and we’d really like to see it break the record in terms of fund-raising so please get your arses down to the Attic Bar and if nothing else buy yourselves some raffles tickets. You are currently browsing the archives for the Charity Auction category.